This year give the gift of choice; Downtown Dollars! Downtown Dollars were introduced in November of 2013 just in time for the holiday season. The Main Street Office is reminding shoppers that Downtown Dollars are gift certificates that support local businesses and are sure to please even the pickiest of gift recipients. The Dollars can be purchased in denominations of $5 and can be used at over 30 locations downtown. Several new businesses have been added to the list since last year. The variety of retailers gives the user the freedom to choose between a night on the town, a new outfit, spa treatment and more! The money that is spent stays local which is also a great gift to give to the downtown merchants. 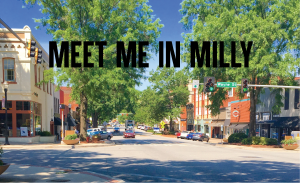 The list of Participating merchants can be found on the Main Street website at www.milledgevillemainstreet.com, is attached to each purchased certificate and available by request in the Main Street office. Downtown Dollars can be purchased in the Main Street office located at 105 East Hancock Street in Historic Downtown Milledgeville. Keep it local this holiday season- Shop Small to support the local economy!